After a really successful Kickstarter campaign, the first part of The Banner Saga trilogy was released four years ago by former developers from Bioware studio now rallied under the banner of Stoic Studio. A subtle mix of influences from The Oregon Trail for the caravan and management side to XCOM for the turn-based part, the saga narrates the perilous journey of Rook, his daughter Alette and their companions swept away in a long march to the west in the middle of a “Nordic” themed end of the time. While you can read the first episode review on our site, In preparation for the third and final chapter of the trilogy, The Banner Saga 2 is finally out on Nintendo Switch, and while it does not fundamentally change the formula established by the series, it does polish some details but is it for the best? In order to spice things up, Stoic focused on the turn-based battles, with a series of new opponents, playable classes and specific goals to complete per battles. It is possible, for example, to shorten the length of certain battles by concentrating your attacks on the leader of a pack, to undermine the morale of his troops and prematurely end a fight that could have caused you very heavy losses. We find similar combat mechanics with two separate bars for the units to attack according to the same requirements: health and power in red and shield value in blue. A host of new abilities now allow us to use enemy defenses to attack their vitality gauge. We also note the arrival of a second active skill once rank five is reached or the addition of a new faction known Centaurs to the ability to move more suitable for coverage of great distances. Finally, Stoic offers an appreciable layer of dialogue during the combat, an addition that helps to put a little more into the narrative of the game. For the few newcomers trying the crazy bet to launch the Banner Saga 2 before playing the first, Stoic offers a course of crash course video to catch you up on all the main events of the original title. If you played the first one and finished, you will be able to import your save file, which will simulate and alter the game based on the original Banner Saga important choices before starting the next adventure. The other gameplay side of The Banner Saga 2 (and the original one) is in the form of resource management in the slow and delicate progression of our caravan. In the northern kingdoms, Renown is the crucial resource to spend with discernment to maintain the general condition and morale of your troop of exiled. While it is essential to advance towards the west without wasting too much time, the general morale of the troops is constantly decreasing while you do so, and your caravan consumes food and supply, plus it is necessary to take care of the wounded from the previous battle. In the course of our more or less serious decisions, we will recover valuable resources to spend wisely according to the priorities of the moment. No need to hope to save everyone, the strategic part related to the management of resources once again instills this tension that every moment carried by our decisions will require necessary sacrifices. The regular establishment of camps always allows the player to manage his heroes by either buying new equipment or upgrade their skill points and various other statistics. You can now also train with your teammates to refine your strategies and unlock some secondary bonuses. The phases of dialogue between the characters use again long fixed shots just animated by a few locks of hair oscillating in the cold wind or by one or two winks of eyelids. It does not take much more to create an atmosphere as successful as the first part of the saga carried by an excellent artistic achievement. On the soundtrack front, while I kind of like the Austin Wintory’s work on the themes, they are still too discreet and hidden in the background. In the end, The Banner Saga is built on the same model and sequence of events as its predecessor: scenes of dialogue during which it will be necessary to make crucial choices, long marches where decision-making will be crucial, moments of rest in the camps to manage troops and finally, phases of turn based combat. A cycle progression maintained here at the risk of dropping some players into a certain routine, but fans of the series will not be disappointed. 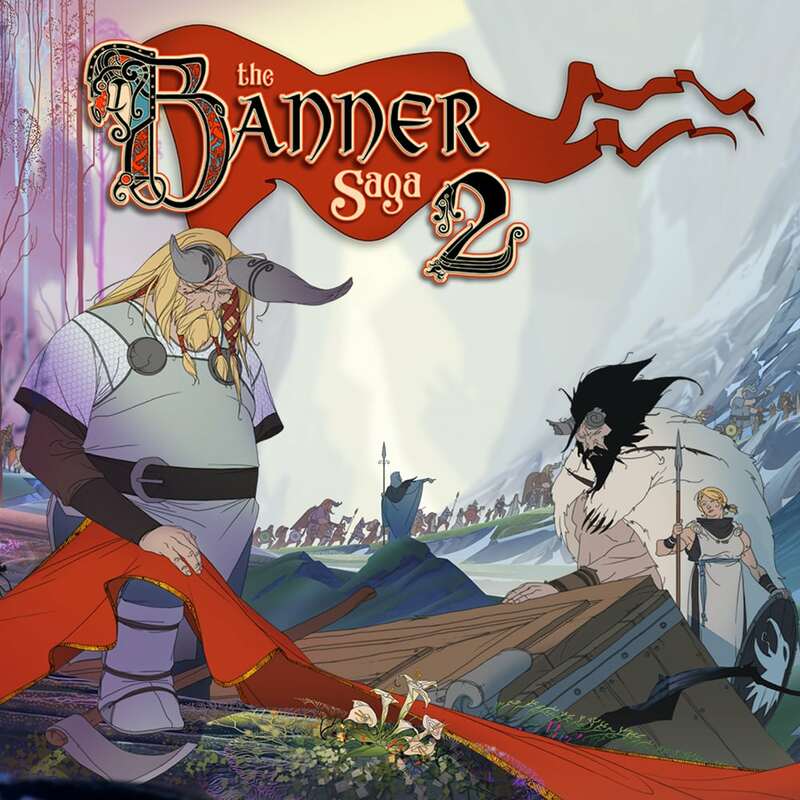 The Banner Saga 2 was reviewed using a Nintendo Switch digital download code of the game provided by Stoic. The game is also available on PC, Xbox One and PlayStation 4 via digital store releases. We don’t discuss review scores with publishers or developers prior to the review being published (click here for more information about our review policy). Now available on the Nintendo Switch, The Banner Saga 2 retains the excellent foundation of its predecessor without any major upgrade of the formula, but that's not a bad thing. Fans of the series should not skip this, and it's a definitively needed chapter before the upcoming end of the trilogy.